Our team of awesome horses has countless hours of experience, insuring you with a wonderful ride. Pulling a carriage is a simple task for a horse to perform; with virtually no weight on his back, the horse can easily start a carriage rolling. Studies have shown that it take about 50 pounds of force to start a carriage rolling and even less to keep it going. Many experts claim that pulling a carriage is easier then carrying a rider because of the physical make-up of the horse. Our animals are treated with love and respect and have never been mistreated or abused while in our care. Our horses live on a 20 acre Farm and are fed twice daily, groomed watered and exercised and have individual stalls in and exceptionally clean barn. Our horses are offered Hourly water breaks when working. We do not allow our horses to work more than 6 hours in any 24 hour period and no more than 3 days a week. Our horses wear anti slip shoes with leather or rubber, shock absorbing pads, protecting their hooves from the pavement or heat. We do not operate our horses if the temperature exceeds 90 degrees. This is in accordance with the city’s recommendation. 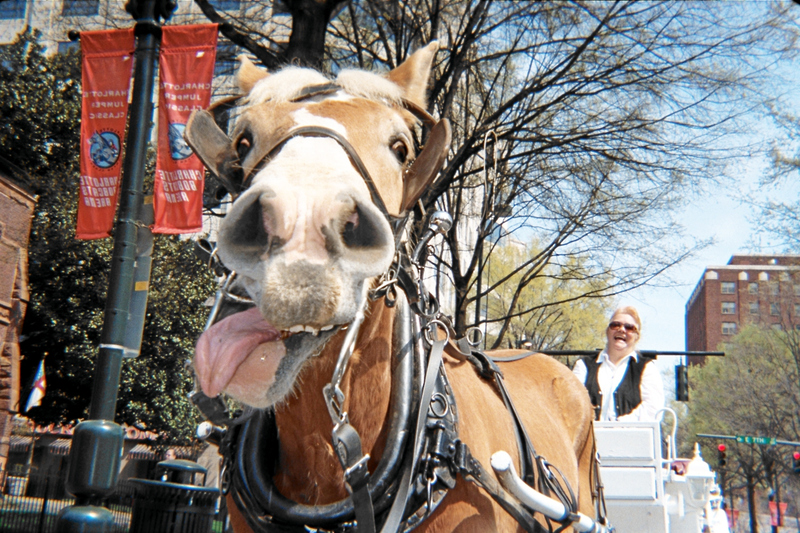 Although carriages have always been allowed on the Charlotte streets, there have been NO reports of ANY incidents in AT LEAST the past 10 years.